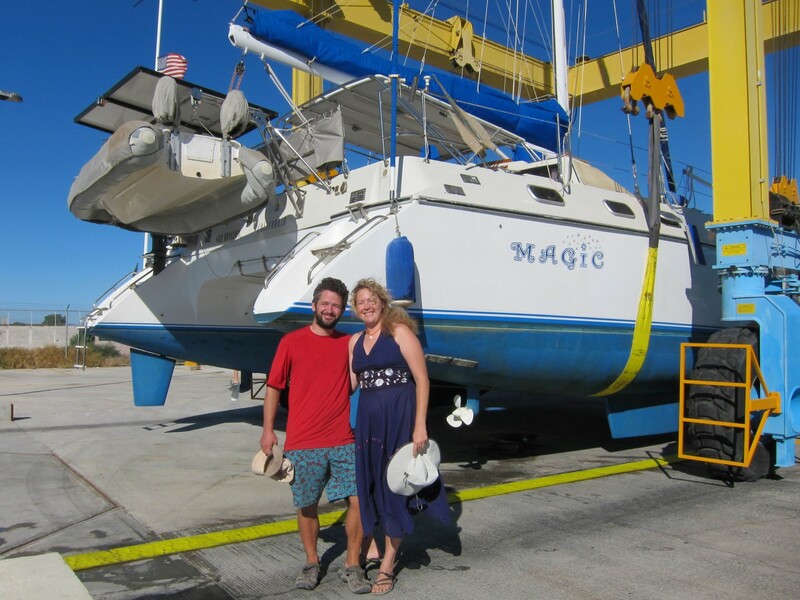 Before we first went sailing on the Sea of Cortez in our Great Dane 28’, we looked at a big, beautiful catamaran named Magic. It was for sale in La Paz, Mexico. Magic seemed like a palace with four bedrooms, two bathrooms, teak floors and a full kitchen with pantry, fridge and oven. Magic reminded me of a luxurious RV, compared to our current boat which is a bit like living in a floating van. We went to sea and bounced along on small ocean waves in the little 28’ boat. We enjoyed some great snorkeling and beautiful anchorages, but the boat was pretty tiny for two people on a long voyage. After 10 days of cruising in the little boat Brian asked if we should make an offer on the big catamaran. He wanted to see if I liked cruising before getting the big boat and he had also been thinking about buying a catamaran for a couple years. His dreamboat (no, not me, haha) just happened to be in the right place at the right time. I had already tasted the sweet cruising lifestyle on the little boat, and I was ready to cruise on the big, beautiful catamaran! Sign me up! 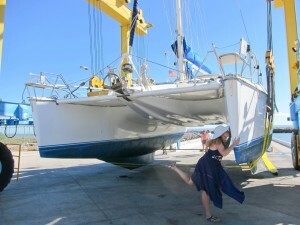 We returned to La Paz and started the process of buying the boat. It was very similar to buying a house, with an initial offer, counter offer, then a full week of inspections. After the inspections, the seller fixed a few items, and finally the closing took place today at a title company in the US. 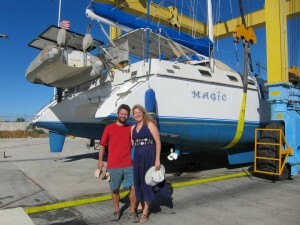 We never had to leave Mexico and our brokers at La Paz Yachts were very helpful. The first inspection was called a “sea trial”. This was our first time test driving the boat, unfurling the sails, and firing up the motors. Brian loved driving the boat. It moved through the water gracefully. I made sure to carefully evaluate the lounging areas on the many decks and trampolines. I did drive the boat for a few minutes, too, and it was an amazing feeling to be behind the wheel of a big boat. The hull survey was scheduled for the next day. Our hull surveyor was a legend in the La Paz area. 89 year old Cecil knows everything there is to know about boats. When we told our friends at the marina he had been our surveyor, they were so excited and told us we had gotten the best surveyor in all of Mexico! Cecil has a long history of building boats and has sailed all over the world. 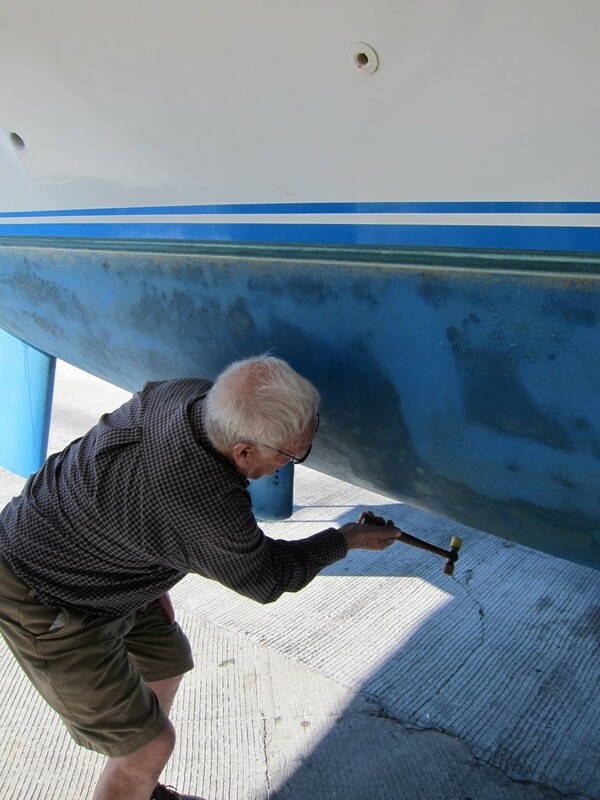 He was so spry and enthusiastic, ambling all over the boat, squirming into the engine cabinets, wiggling around on the floors to peer into the bilges, and giving us a great deal of valuable advice. The next portion of Cecil’s process was the hull survey. This involved a huge crane hauling the catamaran out of the water and setting it gently on the ground. Then, Cecil went all around the bottom of the boat (the “hull”) and tapped it with a funny little hammer that looked like it belonged in a cartoon. He was listening for hollow spots in the hull. Cecil gushed about how great the boat was. It only had a few rough edges, as he put it, but is in great shape for being 22 years old. His enthusiasm for the boat and for surveying was delightful and he was a joy to spend time with. Next it was time for two different mechanical inspections of the boat’s engines. The boat passed the inspections so we moved forward to the final (and most fun) part of the process – getting the paperwork notarized to close escrow on the boat. The nearest American notary was a one hour drive away in Todos Santos, so we rented a little car from Thrifty and hit the road. We arrived in Todos Santos and found our way down dirt roads to an orange, two story house where the notary lived. She was a blonde woman from Minnesota who greeted us with a friendly smile and showed us inside her colorful house with Spanish tiled floors. As we chatted, her large dog wiped drool on our clothing as he demanded attention with much persistence. A fluffy cat lounged on a red couch. We sat down at her kitchen table with the dog hovering nearby. After just a few minutes, papers were signed and notorized, we paid her 250 pesos (about $20 USD), and we were on our way. Now it’s official! Magic is our boat! Here I am, expressing my love for her with an exuberant kiss. We will enjoy a few days this weekend cruising the Sea of Cortez islands aboard Magic, then bid her farewell for a couple months while she waits patiently at the marina in La Paz. We will return to the US February 20.